Successfully Added Business Phone for Computers (VoIP, Skype, Landline) to your Shopping Cart. 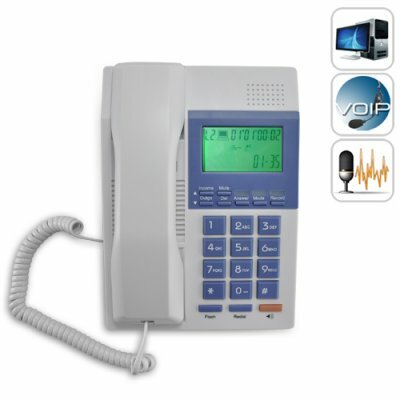 Business phone for computers - the look and feel of a regular landline telephone with the functionality of the modern internet phone that makes it ideal for commercial, business, and personal use. If your job requires you to frequently use a telephone, then this business phone can be your own personal assistant that is sure to improve both communication efficiency and service satisfaction. When not used as a regular landline phone, the wide range of uses and functions make it ideal for small retail business, home based internet business, front desk receptionists of architects and engineers, small hotels and restaurants, tech-savvy homes. Improved Efficiency and Higher Customer Satisfaction: How great is it that you can pick up a conversation from weeks ago and still remember all the details? With this Business Phone for Computers, you can add notes and personal comments to your phone book contacts which will pop up once you call or receive a call from them. Instead of putting your customers on hold and having them wait, imagine how amazed they would be when they call and you instantly replied: "Oh hello, Mr. Smith. You are a valued customer, of course we remember. Your order #30928 for 10 MP4 players is already on the way. It should arrive tomorrow." Easy Calling and Internet Dialing: A simple USB connection is all it takes to turn this Business Phone for Computers into a convenient internet phone that you can use with MSN and Skype. Along with one-click dialing, you can click a telephone number from web pages, files, communication software, and even the phone book itself for instant calls. Call Recording and Built-in Answering Machine: This business phone allows you to automatically (or manually) save a copy of your phone calls directly to the hard drive in MP3 format. Great for situations when you need reconfirm that the customer just said "I want 1,390 car DVD players" and those your word against mine disputes when he actually meant 390. As the ultimate solution to your business communication needs, this business phone can easily help you increase customer loyalty and improve management efficiency. Available in our warehouse now, order today and we'll ship it out tomorrow! Brought to you by the leader in China Electronics - Chinavasion. Does this business phone need a power adapter? No, it can be powered solely by the telephone line or the USB cable. Does this business phone support wall mounting? Yes, a wall mounting adapter is provided that easily the phone to be placed on the wall. Can this business phone work in the USA? Of course, you can use it anywhere in the world!